(Nanowerk News) Researchers in Singapore have developed a new material that can potentially replace the silicon widely used in sensor chips in appliances, paving the way for smaller and cheaper electronic products. Silicon-based sensors, also known as semiconductor chips, are used everywhere — in refrigerators, washing machines and traffic junctions, for instance — but it is becoming more complicated and costly to make these chips operate faster, and with more sensitivity. Higher sensitivity is prized in the industry as it can reduce error rates when transmitting signals. It also reduces costs since it eliminates the need for extra circuitry when certain electronic signals have to be amplified, which in turn allows for more compact electronic products. “Different sets of equipment are needed to develop silicon sensors that are higher in quality. 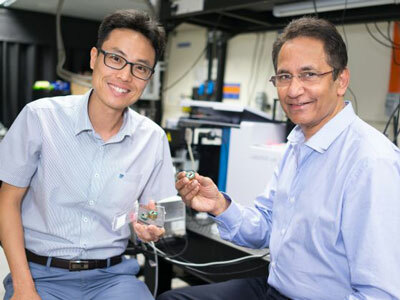 Such equipment comes in the range of the hundred millions,” said Associate Professor Yang Hyunsoo at the National University of Singapore (NUS), who headed the development of a new type of sensor chip that uses graphene in place of silicon. Prof Yang Hyunsoo and Prof Thirumalai Venkatesan. In the search for an alternative for future technologies, Prof Yang and his team turned to graphene — flexible carbon sheets. Studies show that the new chip that uses graphene is more than 200 times more sensitive than current chips available in the market that use silicon or indium antimonide. Supported by boron nitride substrates, the graphene-based sensor chip forms an interface whereby electrons can move very fast in the material. “These electrons can thus respond to magnetic fields with greater sensitivity,” said the professor, who is from NUS’ Department of Electrical and Computer Engineering. The material is in the process of getting patented. In addition, the graphene material is also flexible “like paper” — which makes it suitable to be incorporated into wearable technology — and demonstrates stable performance across temperature changes. Current silicon-based sensor chips will break when bent, and change in properties between room temperature and 127°C — the maximum temperature at which most electronic products operate — affecting their reliability. With a graphene-based chip, the NUS researchers found a gain in sensitivity of more than eight-fold at 127°C. This makes it a suitable chip for environments with a higher temperature. The cost to harvest graphene is also much lower compared to silicon. “By principle, sand is very cheap, but the numerous processes to get silicon from it cost a fortune,” he explained. Following the findings, the researchers at NUS plan to scale their current 2cm-wide sensor up at least 10 times for industry use, said Prof Yang. A common wafer size for silicon is 30cm. “The industry wants big wafers so they can cut and shape from it to cut costs. The challenge is in keeping the graphene sensor material stable and consistent in bigger wafers,” said Prof Yang. The sensor chip industry is expected to grow to US$2.9 billion (S$4 billion) in five years, according to NUS. The industry was estimated to be worth US$1.8 billion last year. The invention was published in the Nature Communications journal last month ("Extremely large magnetoresistance in few-layer graphene/boron–nitride heterostructures"). The chip was developed by an interdisciplinary team that includes researchers from the NUS Nanoscience and Nanotechnology Initiative and the Centre for Advanced 2D Materials at NUS Faculty of Science, as well as a professor from the University of Manchester.